I'm trying something completely new and out of character for me. Although I enjoy sci-fi, I've never been into that genre of games, preferring to spend my time in fantasy worlds. After reading many articles about EVE Online and the games recent sweep of gaming awards, I decided to give it a try. EQ2 has recently merged many of its servers. I had a level 21 Summoner on Highkeep that I didn't want to lose. Right now I don't plan on going back, but subscribing for a month is worth ensuring that my character was moved safely to one of the new servers. I still miss the extensive and versitle crafting system. I really felt as though I was a Provisioner. The animations and graphics still struck me as amazing. When I ventured into the lowbie world it was still fairly empty, guild chat was quiet and it felt lonely. I'm not sure how my tellurin turned into a centerpede instead of the black spider I had when I left, but its not much of an improvement. I really dislike the pet types. They aren't the fantastical creatures I was hoping to control and have share my experiences. 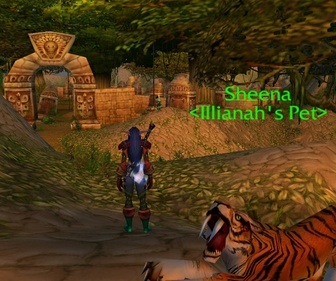 Tolbold's blog discussed one of my biggest issues with the end game in WOW - "Closing Doors". The Molten Core treadmill. It's complete longevity suicide to race to level 60. The grind for gear, gold for potions and repairs bills becomes a grind as time consuming and unchanging as the leveling to get there. Too many players race to 60 because it's cool to be at the top of the hill, the gear is awesome and their guild raid schedules are focused on this end-game content. I'm not sure they realize the monotonous robotic grind it becomes after you've gotten your great gear and arent earning XP to level. Even at a rushed pace, MC is 4 to 5 hours for experienced guilds. Each class has their very specific role, from which you can rarely deviate if the raid is to race forward at frantic paces designed to get people in and out, as quickly as possbile. 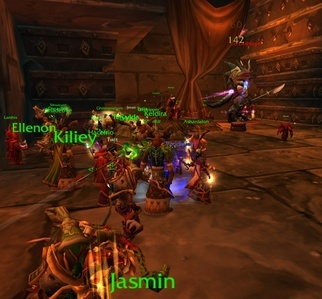 Many guilds require a minimum set of bots and macros to automate and speed up your responses, which only adds to the robotic feeling of the raid. In my opinion, level 60=raid grind+pvp grind+loot grind. There is no more character development. And I suppose any game must come to some conclusion - that growth can't be infinite. Just wish the end-game was something other than this. I iurge others not to charge head-long in pursuit of level 60. It's the journey and the friends you make along the way. Take the time to enjoy it! The guild that I'm a member of, is still what makes the game sustainable. MEO - Will Turbine Deliver? I'm still periodically checking the Turbine site for Lord of the Rings Online, formerly called Middle Earth Online. I still don't see a release date. It was due out a couple of years ago and supposedly delayed to obtain the LOTR license and the right to use Lord of the Rings. After my Asheron's Call 2 experiences, I have my doubts about Turbine. Can they make a visually compelling game? Absolutely! Will the game be full of the mood and feel that makes you feel immersed in Middle Earth? Sure! The question is can they create a world that has staying power, avoids the grind-mill and has a thriving player economy. I have my doubts, especially about the latter which faltered so seriously in AC2. Only time will tell. If you're still curious after 2 years of delays take a peak. Sadly, that grinding feeling is starting to hit me again. I believe it's partly due to the way that I play the game. I do only 25% of the quests and 60% of the instances. So how is it that I level? I slay mobs - what other's call grinding. I don't considerate it grinding. It's what I enjoy most about the game. I don't mind doing it. It's more that there isn't much to do in between. Pick-up groups are hard to find in the lower levels, dont function well when they get off the ground and succeed/complete the instance even less. Professions are just more - well, grinding. I think I need more middling time. Fun diversions or more evolved crafting professions. 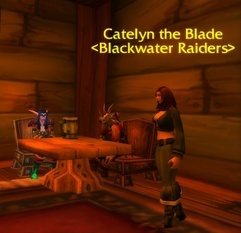 I'm wishing to a degree, that I had at least tried a toon on a role-playing server. I love my hunter, just not the leveling. I can't bare the thought of starting over. Yesterday the Gates opened on Illidan. I hadn't planned on doing any of the raids right away because I'm focused on leveling my hunter. However, I couldnt resist taking a peak when my guild put out the call for one-and-all to race to Tanaris. I quickly mounted - well, as quickly as was possible given the massive lag, and went to join my comrades. I never got close to the gates. All the guilds were camping the crystals and pulling the mobs into Gadget to gain the aide of the brusiers. 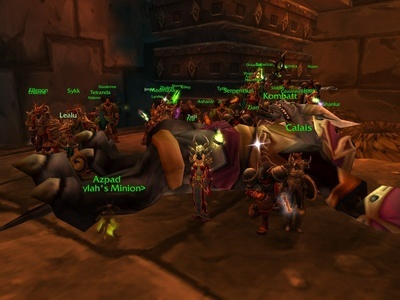 Which ever raid tapped the mobs first would own rights to the loot and rep gained. As you can expect, this was a mad frenzy. Death abounded as these Ahn mobs stomped both players and NPCs alike. Everyone's armor was broken within 30 minutes. As a caster, I didnt bother to repair since it doesnt impede my ability to deal damage. And I couldn't afford the 15g repair bills that other members in the guild were racking up. What's the point in repairing, when we die so much? After a couple of hours I had to log. It was lots of fun. Green and blue items dropped galore. The whole experience took me back to my days of NE Nepath and North Drop mana hours on the now defunct, AC2. Just a quick post to cement the memory. 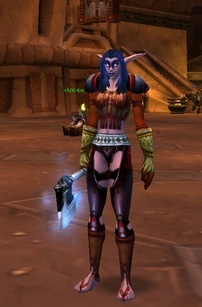 Woot, my Night Elf Hunter is level 40! I splurged a little to upgrade her armor and main weapon. She doesn't have enough gold. I'm disappointed about this but will just get the funds from my main. Besides, she's been supplying all my level 60 Warlock's raid potions for the past 3+ weeks. The Fire Protection potions she's sent alone, are probably more than the 100g needed for the mount. Bite 6: Bite the enemy, causing 49 to 59 damage. Dash 2: Increases movement speed by 60% for 15 seconds. and first attack breaking stealth does 135% of normal damage. The funniest video I've seen creating by using, World of Warcraft. View it here. I don't want to race my hunter to level 60. Resisting the tempation is sometimes hard. But I already having a raiding character, know the drill and expense. There's no point in running toward an end-game that possess some limitations for me. Trying to experience something new, I moved into Stranglethorn Vale. I completely avoided this area on my main. At the time, the bruisers weren't working and horde ganking was rampant. In my opinion, it wasn't worth the bother. Today I'm not concerned. 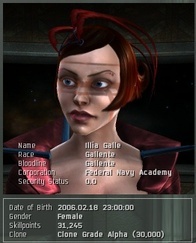 I'm a more experienced character, the Bruisers work most of the time and I want to see new sights. Living in an Inn that is also populated with Horde seems strange and presents an uncomfortable feeling. Sitting across from a Horde player who was also resting, seems a very odd combination in deed. The Broodlord goes down!! We pretty much cruised through the dragons and whelps this time. We came prepared with the knowledge of our previous attempt. Healing was on-point and very few deaths occurred. We did wipe on the first attempt at Brood. I'm said to say that I pulled aggro - bad Warlock. I wasn't the cause of the wipe, but it was a bright spot in my day. Others pulled aggro shortly after, tanks went down and with less than 1% health he obliterated the raid. On the second attempt we got that you must not pull aggro in this fight. Sure, we say that on all the bosses. However, on Brood it's doubly important. Once you pull aggro, you will stay on his hit list even if you stop doing DPS. You will only drop from his target list after he knocks you back or you die. Niether of which are very beneficial to the raid as a whole. For all you trigger happy Mages and Warlocks, do not...I repeat, do not, pull aggro on Broodlord. Managing ranged damage more carefully, we took him down on the second attempt. I was too excited to note the loot that dropped. It was all hunter.